Oranges are a great tasting, healthy fruit that are also an excellent source of vitamin C. The many different uses of oranges, ranging from food and juice to skin care make them a perfect gift too. Sending gift baskets with oranges is a much healthier alternative than candy and shows you care about health as well as taste. A gift basket chock full of nutritious oranges will satisfy anyone who cares about maintaining a healthy lifestyle. Because oranges require a subtropical climate, 70% of the oranges grown in America are grown in Florida with California coming in second and Texas and Arizona trailing along behind. Second only to the total value of the grape crop, the orange is the second most profitable fruit crop in America and accounts for nearly 20% of all fruit and nut revenues in this country. Because all juices and fresh fruits in the U.S. are processed under the standards set up by the U.S. Department of Agriculture in order to maintain the standard of quality and efficiency, oranges are one of the best regulated commodities this country produces. Oranges are popular for their sweetness, taste and well-deserved reputation as a healthy food and juice. One glass of Florida OJ has all of the vitamin C the body needs for an entire day and the vitamin C also works as an antioxidant that fights free radicals that can damage healthy cells and increase the risk of diseases like cancer and heart disease. Vitamin C helps boost the immune system and has been shown to reduce the frequency and duration of minor illnesses like colds, and it is also important to maintain healthy skin, teeth and gums. 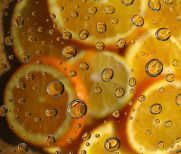 Oranges also contain other healthful nutrients like vitamin B9 and vitamin B6 along with potassium and magnesium too. Vitamin B9 is necessary for a healthy immune system and vitamin B6 helps organs make white blood cells and fight infections. The potassium and magnesium have been shown to lower blood pressure and reduce the risk of heart attack and stroke.